In May 2017, the Liverpool Irish Festival were delighted to be able to attend the Irish Government’s Global Forum; a conference that brought together organisations from around the world that support the Irish Diaspora. As well as meeting people from the Irish Centre in New York, social workers from Australia and many more besides, we were delighted to meet representatives from Mind Yourself, a London based support organisation, with a great creative project, which we thought might be of interest to our readers. Here, Judith Orr outlines that project. The Irish community in Britain has made a huge contribution to the life, culture and wealth of Britain yet it faces specific physical and mental health problems. The last census shows that Irish people have the highest median age of any other ethnic group, which reflects the fact that more than 50 percent of Irish people in Britain emigrated from Ireland before 1970. Irish people are also overrepresented in crisis mental health services and in-patient admission for depression, meaning that of those patients suffering with ‘levels of crisis’ a higher proportion of admissions will be of Irish descent. There are many suggested explanations. Irish people are sometimes less likely than others to go to a doctor if they have a problem – physical or mental – but in particular, the stigma attached to mental health issues means that often people will be forced seek help only once they reach some sort of crisis. This is mirrored with, for example, cancer diagnosis and care for which people often put off going to mainstream medical services for help until curative care is unavoidable. Mind Yourself is a charity that supports the health and wellbeing of Irish people in London, the city with the largest Irish community in Britain. We address the health inequalities experienced by Irish people in many different ways. Social isolation is a problem, particularly for many older Irish people, who the census shows are disproportionately more likely to live alone. We combat this with varied group activities, from creative writing, history themed walks to art and music sessions. We also offer one-to-one support for those that need it. We have found that men in particular find talking about themselves, their life and health difficult, so we launched a project called Deserted Island Discs, with the aim of encouraging Irish men to talk their lives and experiences through the music that has influenced them. It’s an oral history project with a musical twist and it’s been a great success. Dublin born DJ Arveene Juthan interviewed the men, all from different backgrounds with their own unique life stories. Each sound file brings alive the varied circumstances that brought people from all over Ireland to find a future in Britain. The Deserted Island Discs project concentrated on men, as they are often hardest to reach in terms of expressing their feelings and fears, but all our other projects work with men and women. It’s interesting that Irish emigration to Britain stands out, because of the number of women who came alone to find work, something that is more unusual among other emigrant communities. Some arrived in London when the city was still recovering from the bombing of the Second World War, and those memories are still vivid. Many of the Irish people in Britain who arrived during the 1950s and 60s remember how many Irish people were treated when they looked for jobs and homes. The legacy of the prejudice many experienced is also explored reflecting a time when Irish people in Britain were often treated as a “suspect community”. Others talk about the pressing need to earn money to help support their family from an early age. These life stories are interwoven with the men’s selections of music, which often represent the different times of their life’s journey. The music choices span from traditional Irish songs to soul classics to pop, and include among them a barman and a craft brewer, a librarian and a celebrity chef. After a showcase event for the project, where an audience heard extracts of interviews and music, creator and producer Arveene edited each interview into a single episode. We are treated to a glimpse of the paths taken; of the regrets and joys and the meaning of being Irish in Britain today. Each episode is being posted online so there is a permanent record of these memories and moving testimonies that can reach a wide audience. To stream or download Deserted Island Discs from the Mind Yourself website, click here. This piece was composed by Judith Orr, Fundraising and Events Officer, Mind Yourself. Judith joined Mind Yourself in August 2016. She grew up in Belfast in Northern Ireland and moved to London in 1977 to do a BSc in Psychology at University College London and has lived in the capital ever since. She has worked in many different fields including publishing and bookselling. Her interests are politics, writing and reading. 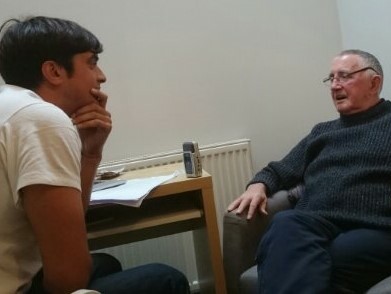 If you are interested in learning more about Mind Yourself visit: www.mind-yourself.org.uk or email [email protected]. For anyone concerned about their or a loved one’s mental health, please be aware services are available in Liverpool. Irish Community Care (http://iccm.org.uk/) works with both the Irish (including people of Irish descent) and Irish Traveller communities and the wider community. In partnership with the Comedy Trust, Liverpool Irish Festival also support a project for men, called Feeling Funny – a course designed to enable men to find routes in to telling their personal stories and exploring their feelings and histories in a safe and supported environment. To find out more, click here. LIF2017 asks – what does it mean to be Irish?